For decades after it was founded, the High School of Art and Design on East 57th Street in Manhattan funneled generations of students into commercial art classes. It did so by immersing its students in four or more art classes a day, in a choice of 13 majors from architecture to fashion design. Graduates include the designer Calvin Klein, the singer Tony Bennett, the playwright Harvey Fierstein and the filmmaker Ralph Bakshi. But as the school celebrated its 65th anniversary last month, alumni, teachers and students worried that a focus on bread-and-butter academic subjects like science and history is watering down the school's commercial art mission, even as money has not been made available to keep the number of art offerings at their traditional level. Critics say that the 1,500 students at A.& D., as the school is known, are now more likely to have two periods of art a day than four. Years ago, state and city budget cuts began stripping away financing for art classes, and even in recent years when the budget has been robust, the money has been diverted to support increased instruction in subjects like science and history needed to pass the state Regents tests required of both vocational and academic students. "The Board of Education has a one-size-fits- all policy," said an assistant principal, John Lachky. "We have to conform to the same requirements as any other school even though we have special needs." State officials, including Roseanne DeFabio, an assistant commissioner for curriculum, instruction and assessment, say that higher academic standards, properly applied, should improve the school. "There was pretty universal agreement that those academic requirements should be the same for everybody," she said. W. L. Sawyer, the Board of Education's superintendent for Manhattan high schools, speculated that the decline in art classes was a result of an increased need for remedial classes. But staff members at the school say that only about 60 of 360 incoming ninth graders needed math remediation, the most prevalent remedial subject, and that such classes were usually given after school. The school still offers career preparation in 13 art majors: animation, advertising, illustration, fashion design, fine arts, architecture, photography, theater arts, medical illustration, cartooning, computer graphics, industrial arts and film and video production. So well regarded are the school's commercial art graduates that companies like Disney visit the school to recruit. "The concentration of art training that I got," said Calvin Klein, a 1960 alumnus, "gave me a very strong foundation. I spent a good four hours a day. I couldn't have gotten that from half the amount of time." Since its inception, the school has trained a diverse group of students, mostly from working- class and lower-middle-class homes. Today, roughly a third of the students are black, a third are Hispanic and the rest are white or Asian. Throughout the years, there have been letter- writing campaigns and walkouts to protest systematic arts cuts. Hope Eisman, the school's principal, says that ever-increasing academic requirements have not only pushed out art classes but have also given the students a heavier burden than other high school students have. Ms. Eisman emphasized that she was an advocate of strong academic subjects. But she added: "You've got kids here who don't want to go to Harvard. My kids want to go to Pratt, Cooper Union, F.I.T. and Rhode Island School of Design. We're asking a kid who doesn't need it to take physics." Karines Reyes, a senior who edited the yearbook and wants to work in advertising, said, "I like math, I like physics, but they are completely useless to me in terms of my career goals." The school, which has historically been classified as a vocational school, is included in the schools affected by a new state policy that will allow courses in math, science and English to be blended with art by including, say, more calculation and writing in an art class. But Mr. Lachky said it was hard to find art teachers also qualified to teach science and math courses on a Regents level. The extra academic requirements have also strained the school's budget, Mr. Lachky said. "Now you have to add a lab to every science class," he said. "Where do you get that one period to give the lab and where do you put the lab?" With budget cuts, teachers complain, comes an increasing lack of technology. "We've been operating in the Dark Ages," said an assistant principal, MaryAnn Geist-Deninno. "Animation was done with flip books until recently, and you end up with a whole class using one digital camera that I bought at Radio Shack." 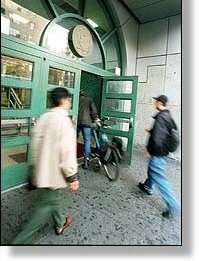 At the Fiorello H. La Guardia School of Music and Art and Performing Arts, on the Upper West Side, the Web site displays a comprehensive art curriculum that includes three periods of studio art a day. But there is a reason for the disparity, Mr. Sawyer says. La Guardia, he said, is a specialized school, backed by state legislation enabling a distinct difference in budget allotment. La Guardia also looks at both academics and artistic ability in its entrance requirements. Art and Design weighs only a student's artistic ability, thereby admitting students who need remediation. The original School of Industrial Arts was started in a dilapidated warehouse on West 40th Street in 1936 by four young art teachers. They made their own desks and storage from orange crates and plywood. After two decades at a former Civil War hospital, the school was renamed Art and Design and moved in 1960 to a new, modernistic building at 1075 Second Avenue. The terror attack of Sept. 11 has also hurt the school. In past years, 500 applicants have turned up on each of four days to take a two-and-a-half- hour art test and submit their portfolios. Now teachers say the number of applicants showing up has been cut in half, and they cite parents' fears of having their children far from home. As a result of the slippage in courses and equipment, alumni like Mr. Bakshi feel the school has changed for the worse. "It's madness what they did," he said. "Why did they take a perfectly good art school that put hundreds, thousands in the business and change its format?"